Born in Kraków, she studied physics at the Jagiellonian University there. She began to act as secretary and public relations officer for her husband, composer Krzysztof Penderecki, in 1965. In 1990, she became cofounder and president of Poland's first private art agency, Heritage Promotion of Music and Art. She withdrew from that activity in mid-1995. As manager of the Pablo Casals Festival, San Juan, Puerto Rico, she has been helping her husband, Artistic Director of the Festival. Elżbieta Penderecka is a member of the Boards of several foundations , including the European Mozart Foundation, the seat of which has been in Poland for the last four years. A co-founder of the Foundation, she takes an active part in the work of its Advisory Board and Board of Directors. She has largely encouraged the creation of the official Orchestra of the Capital and Royal City of Kraków  Sinfonietta Cracovia; she is now its patron, promoter and organiser of its concerts. Since 1996, Ms Penderecka has been President of the Programme Council for the Kraków 2000 Festival. 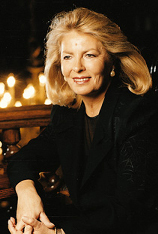 She organised Kraków's First Beethoven Easter Festival in March 1997 and its second edition the following year. She is also Artistic Director of the Krzysztof Penderecki Festival, organised in 1998 under the auspices of the composer himself. In 1997, she initiated a cycle "Concerts of Great Masters  Elżbieta Penderecka presents", which already featured such celebrities as Mstislav Rostropovich, Jessye Norman or Simon Estes. She is planning to continue the cycle in the years to come, and to begin another one: "Great Pianists". In November 1997, she organised a flood relief concert with Studio Art Centre. The concert featured Sinfonia Varsovia, Lord Yehudi Menuhin, Poland's National Philharmonic Choir and soloists Izabela Kłosińska, Arto Noras and Ewa Pobłocka. Ms Penderecka was awarded the Commander's Cross of the Polonia Restituta Order in November 1996 and, in November the following year, the Pro Musica Viva Prize of the Maria Strecker Daelen Foundation for her outstanding achievements in Polish and international culture. On 10 January 1998 she received the Special Golden Statue Prize of the Business Centre Club. The upcoming events of the "Concerts of Great Masters  Elżbieta Penderecka presents" cycle include special performances by Barbara Hendricks (5 November 1998) and Stanislav Bunin (8 December 1998). Ms Penderecka will prepare the Third Beethoven Easter Festival for 1999. In the year 2000, when Kraków will be celebrated as one of the European Cities of Culture, she will invite there the New York Philharmonic, the Bundesjugend Orchester with Gerd Albrecht, the Norddeutsche Rundfunk orchestra with Christoph Eschenbach and many other European ensembles. She is also planning the first edition of the Pablo Casals Violin Competition in San Juan, Puerto Rico.